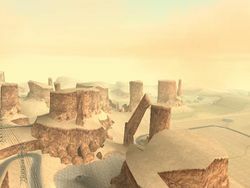 Bone County is the desert region spanning the northern and northeastern portions of San Andreas. This arid region is the largest continuous land mass in the entire state, and suffers from frequent sandstorms.The general sentiment is one of rugged isolationism, juxtaposed against the one bustling, sparkling oasis in this vast desert, Las Venturas. 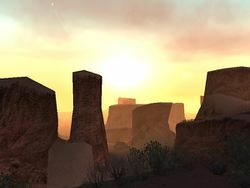 Bone County is home to large public works projects, such as Sherman Dam and The Big Ear; tourist traps like Regular Tom; large rock formations like El Castillo del Diablo and Arco del Oeste; ghost towns such as Las Brujas; a quarry; and a top-secret government research facility, Area 69. It is based on counties located within the Mojave Desert, Las Vegas. The radio station K Rose broadcasts from somewhere in this desert, as does the Area 53 radio show, featured on WCTR. On the radio show Gardening with Maurice, a woman from Bone County inquired as to why she can't grow flowers, to which Maurice replied "Get out of the desert, you moron.". Bone County is also home to three 'myths', namely the mass grave, a serial killer, and UFOs.